Inspired pieces create inspired spaces. 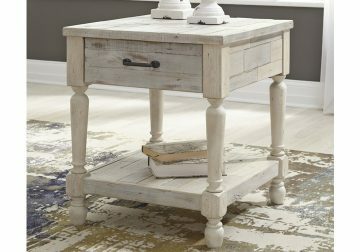 The Shawnalore rectangular end table charms your home with farmhouse style. White textural finish highlights the weatherworn feel of the wood tones and purposeful nail holes. Roomy drawer puts essentials out of sight. 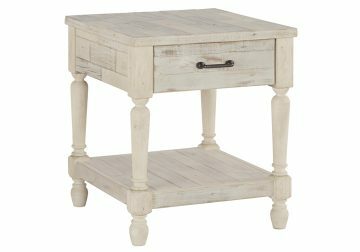 Display fashionable books or decor on the planked tabletop and bottom shelf. Shawnalore Whitewash Occasional Series by Ashley. Made with pine solids with textured surfaces. Finished in a white textural color that highlights the reclaimed feel of the wood tones and nail holes. Drawers are fully finished with dovetail construction and ball bearing guides. Wrought looking bar pull hardware in an industrial silver/bronze color finish. T782-21 cocktail table has a thick tufted cushion top in a linen look cover.